Anyone out there interested in a rally car build, it can be either a WRC car or even your local club or National rally Champ car it doesn't matter. Also it can be dirty, clean (as in the start of a stage), night stage or ready for night stage, or at the service park being worked on for the next stage it's up to you. Time period for this build would be 12 months and start time would be say Jan. 1st 2011. 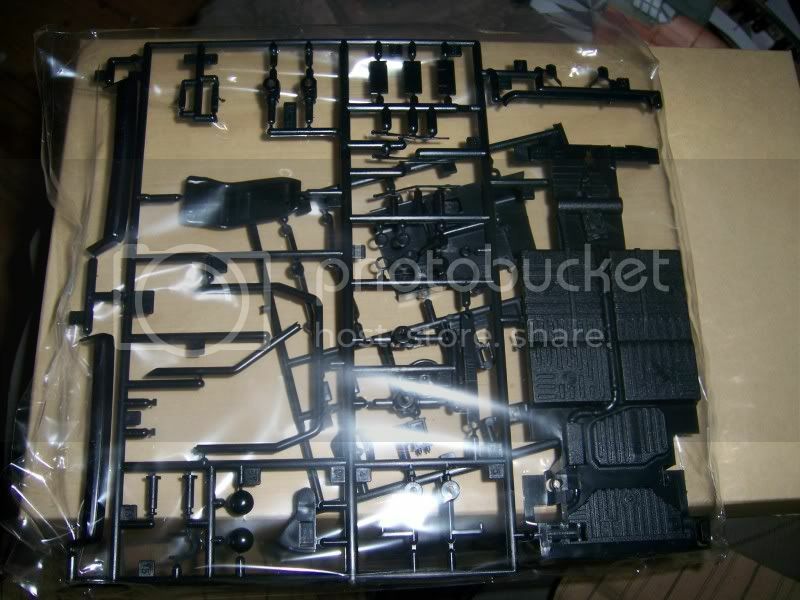 All kits must be new and presented as a closed box then all parts shown before assembly. Any other suggestions welcomed. Hi dingo, I'm interested to have a go at your CBP with a Revell McRae/Sainz Ford Focus WRC kit I have on the shelf. If that's OK I look forward to the 1st January 2011 so I can crack on. 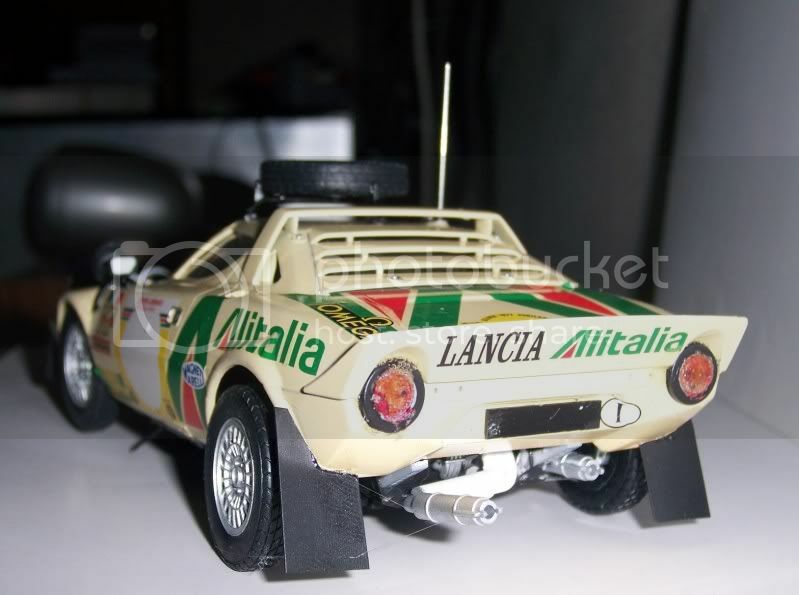 (I've not done a CBP before only my own threads) I'm half way through a Lancia Stratos build so I can't use that one! im very interested in joining, ill have to look through my stash to pick a car out for this one. Patrick the Focus will be fine, I built a Stratos sometime it was a great car to build and I enjoyed putting it together, truckaddict good to have you aboard I know the start date is a long way off being Jan 1 2011 but I'm hoping a few of the guys who are in other builds now will be able to come accross to this one in the new year that's why I made the start date them and not say Dec 2010. I will be competing as well so let's hope it goes well. 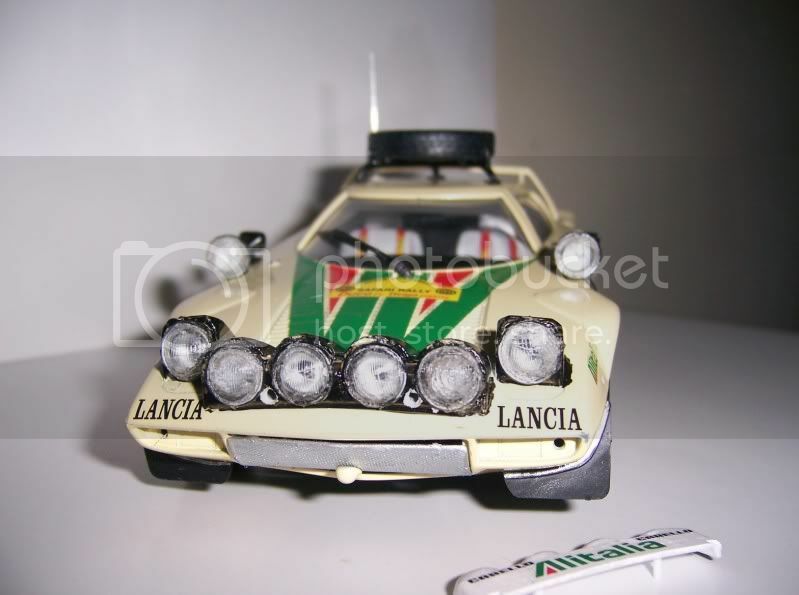 By the way Patrick below is my Stratos from earlier this year. I hope to enter this competition also..
is anything from 1970 to 2010 ok..once it's a W R Car. It's time to assemble the rules..
70s Ford nutter, Cork ,Ireland. The rules are quite simple any rally car from the start of rallying till now it doesn't matter what does matter is tht the kit must be shown closed box first then shown open with all parts still in their plastic from there on it can be clean, dirty, muddy or what ever even a wrecked rally car can be built as long as it's a rally car, I'm not too concerned if you want to do a WRC model or even a Marathon car go ahead as long as it's done between Jan 1 2011 & Dec 31 2011. 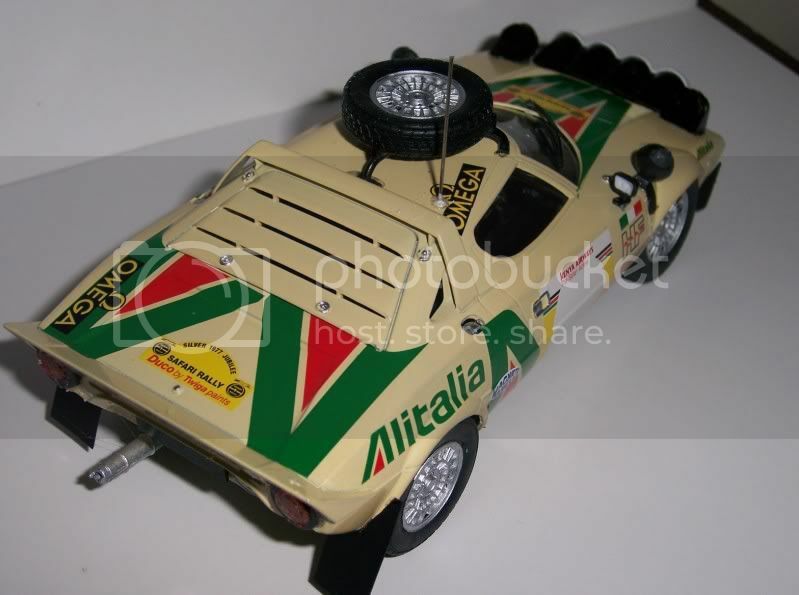 Boreham I've just added my latest Stratos build to the race/rally car thread as just finished today! Does it have to be a rally car that ran, or can we take a car and make a rally car out of something else, say an early 90s skyline. Truckaddict it can be anything as long as it's a rally car, the Skyline wood be great here in Australia many early model Skylines R run as club cars and they R driven hard and spectaculy. My wife and I where invited to the last ralyy of the year run by our local car club as I use to be a member some 20 odd years ago and one guy there ran an early Prince Skyline GT only problem was he ran way too hard into the first corner on the second stage now he has around $15,000Aust damage to be repaired whihhe will do, but man it was a speccy crash he rolled it then hit a tree backend first. Sorry no pictures we didn't have a camera BUT belive me he wasn't happy. Dingo, sorry I should have included you in the post to have a look at my Stratos rendering on the Race car/Sports car thread. Truckaddict that skyline will look great as a tarmac rally burner but would look even better with at least one set of lights on the front, hope Ya going to put a couple lights on it to show that it's a rally car and not a drift machine hate to see one of those things get up hey wot. 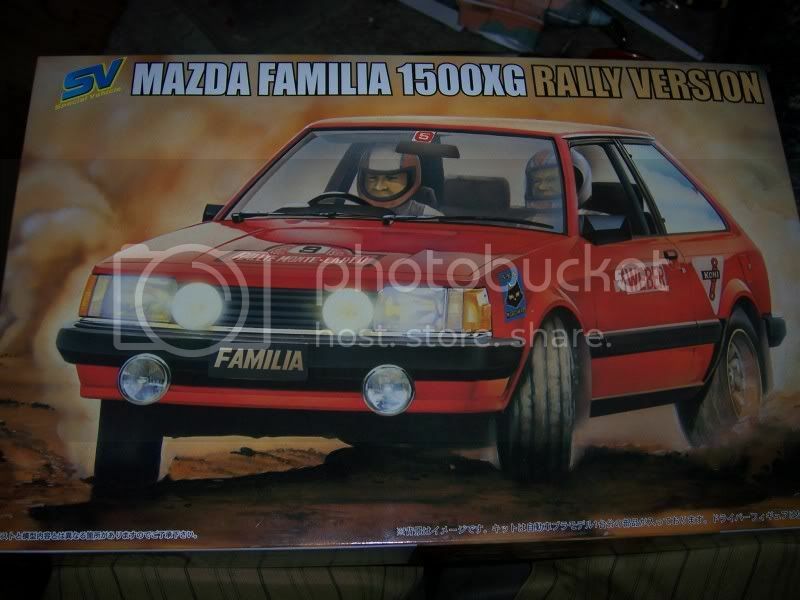 I still haven't decided wot to build yet it will either be a re-run of of my first car I ever rallied a 1974 Toryota Corolla or a Citreon Xzara that I use to co-driver for a friend of mne in the late 90's early 2000's or maybe I'll throw a real cat among the pigeons and chuck in a marathin truck or a London-Sydney marathon car, just haven't decided maybe I need help as I'd ;ike to do all of them (hehehehe). Patrick, I'll let U in on a little secret I used U'r build to help me do part of mine, I got stuck with the stupid exhaust set-up so I went looking for some info and U's fell right into my lap so I used wot U showed on the thread it was great and I can now thank U for the help after completely forgetting about it. Firstly, a very happy New Year to all of you out there! Secondly....here we go with the new build of the McRae/Sainz Ford Focus WRC Monte Carlo rally year 2000 car. I've just given all of the bits a warm soapy wash, cold rinse and while they all dry, I'm going onto the web to search for any info on interior set up/colours/fittings etc. 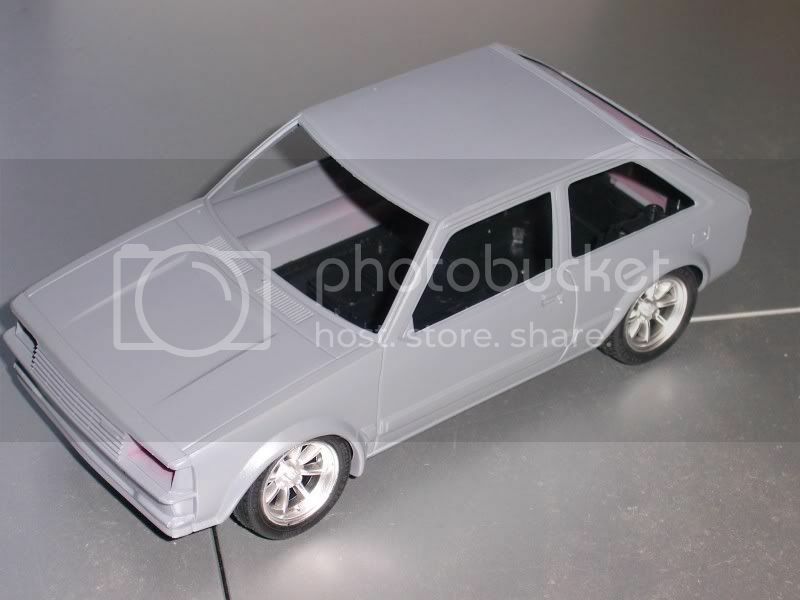 Well I've finally got my car for this build it's a Mazda 323 (Familia) and will be built as a club car for Oz Conditions. 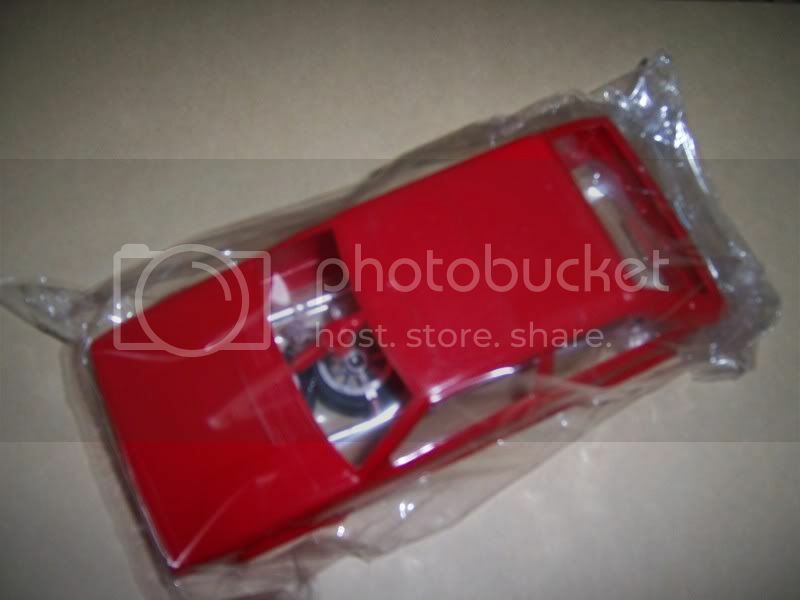 Although this is only a Curbside model I may do another one towards the middle of the year, perhaps a Marathon Ford Falcon. Hi there dingo. When I've finished my Focus WRC, can I build another? As the Dakar Rally is on at present I'm looking at converting a Lexus Harrier kit into a Dakar vehicle. Patrick, U can as many rally cars as U want. It would be great to see a Dakar rig especially a truck, I might even do that for my next one. I'm not going to limit it to one model, I know I'm changing the rules but heck I suppose being the person who set this CBP up I can do that as long as it's not too great a change and I don't think allowing U model car builders to build more than one rally car is bending them too much. 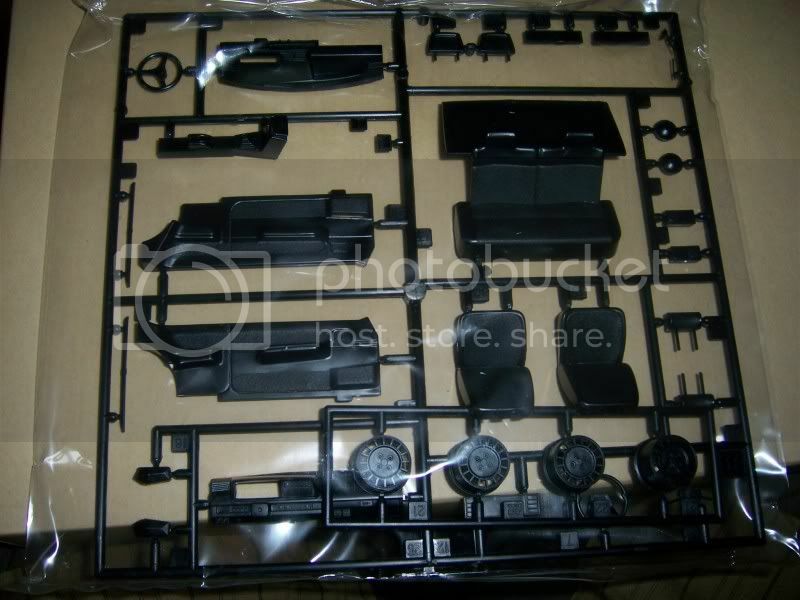 The floorpan with spare wheel and one floor section on the drivers side. One of the door panels, i've painted the roll cage padding in gloss black as the cage is part of the moulded panel. Now we have the sprayed seats. I shall use P/E seat belts as the kit ones have already been used on another build. With fire extinguisher(decalled) floor panels, spare Michelin and the beginnings of the padded rollcage and the hydraulic fly off handbrake. dingo, your comment about a Dakar Truck is interesting. I am already on the look out for a Daf truck/artic unit so that I can extend the chassis and scratch build the box body. But at £35 each they are not cheap. Patrick U might think I'm crazy but I'm not I'd luv to pay 35pounds for a truck kit that equates to just $56aust for me and I'd pay that any day rather than our $120aust or 75pounds a truck kit and I'm not kidding truck kits R crazily over priced here in Oz that's why I'm now back to building cars and importing them from the U.S. at 1/4 of the price we pay here. U'r car is starting to look real good keep it up. I've spent nearly all day making the PE seatbelts, what a pain they are! Here they are on the seats and the seats on the floorpan. And the dash in place and a piece of cable taking the electrical services around the car, the sort of thing you see on rally cars, it keeps the cables etc out of the way and not flapping around under the car. The brake lines also stay inside the car. dingo yes your right on the truck kit costs perhaps I should get one ASAP! 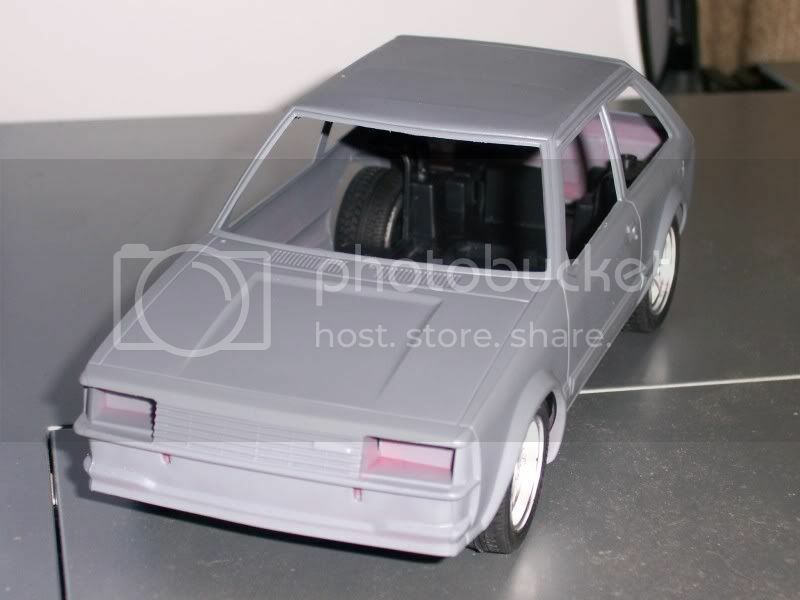 Well Patrick U certainly R doing well with U'r build, here R a couple of pix showing that I have at least got the primer on the body if nothing else. I can tell U one thing Patrick I hope a fewmore builders come on board otherwise this build is going to be either a two horse race or a complete disaster. Yea that would be it for me a complete and utter disaster I can't seems to do anything right or even pick the right subject, I thought this woould've been picked up by a lot of builders after Rally cars can't be all that hard can they. dingo, I don't know which TV channels you have for motorsport in OZ (channel 7?) But over the last few days I've been watched the 100th running of the Monte Carlo Rally, now part of the IRC (international Rally Challenge) for 1600cc normally aspirated cars. The main pro/semi pro field contains factory cars, Peugeot 207/Skoda Favorit/Ford Fiesta and a host of Group N macheinery like Mitsubishi Evo's. Interesting to see on the 2nd day when someone wasn't watching the weather forecast when Bryan Bouffier went off first for Peugeot, as he came into the second half of the stage and it started snowing! He cleared the stage OK with veteran Francios Delecour second away from the start with studded tyres left everyone in his wake as they had only fitted intermediates/snow/winter and slicks. The previous day's leader board virtually collapsed, with Hanninen, Solberg etc take nearly twice as long to cover the stage as the snow came down ever heavier. What a change of fortunes in such a short distance!. Yes your build is looking good already and I also hope a few if not a lot of others come onboard to show their skills in this popular subject. See below, Skoda,Peugeot and Ford. I am enjoying following along with you guys. I would love to join in, but have 3 builds on the go and have to finish them up first. Hey, Patrick, what are you using for seatbelt material? It looks really good. Patrick, I use to watch the WRC here in Oz but since ch.1 a commercial sports station has taken it over ab]nd cut it to pieces with commercials I don't watch it anymore, I use to see it on SBS a community station on a sunday but now it is shown when it actually happens and it could be on here in my home state at 3am or wotever so I will now download it from the net. Hi chillib1. It's ordinary PE material. It said on the pack that it was a seatbelt kit but although it has no decals/or seatbelt names printed on, it is so many brass coloured PE strips in a PE framework and a PE sheet of metal/ally coloured fittings/buckles etc. So you can make as many as you need depending on the length of belt or whether it's lap and diagonal/diagonal road belts/and full harnesses.I've just been out to my cabin and picked the pack out of one of the drawers, it reads;'Hobby Design ref no HD02-0022 1/24 Racing Harnesses (C) for Sparco. The belt strips are smooth on one side and textured on the other (like a fabric). I may have been able to paint them but I don't think so. There a two PE frames with 4 belts on each measuring 10cm long by 3mm wide plus the PE frame with 16 seat buckles/8 larges rounds/4 small rounds/28 various fixings to floor or rollcage and 4 other fixes to make up the buckles that fix all 4 or 5 belts together at the waist. I hope thats not too long and drawn out as an explanation! dingo -If you go onto the IRC (ircseries.com) website it can give you all of the results and a gallery of pictures through each stage. It has some video footage on the right hand side of the homepage. skibum, get those other builds done sharpish and join us you know you want to!